PM Entertainment tries something different and it works. 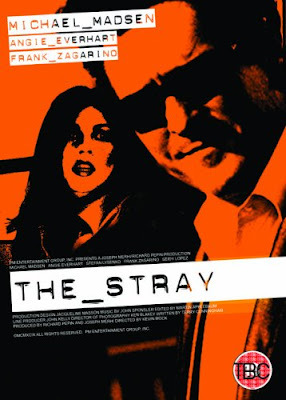 First off, on the box art for "The Stray" it has a clean shaven Michael Madsen on the cover, but really he has a beard. This is not an action movie. This is a drama\mystery. Madsen can easily carry a movie with the right material. He does a good job here as Ben. Angie Everhart looks pretty, and she has some acting chops. The plot concerns Everhart running over a drifter and wanting to help him recover from his wounds. Usually PM entertainment makes action films but this is one of their drama outings. They pull it off with ease. There are some action scenes, but they are just forced in there, so you won't fall asleep. The bike chase was exciting though. If you see it at a video store, give it a chance, you probably won't be disappointed.